As a Bright Spot, the IDRA Coca-Cola Valued Youth Program is part of a national online catalog of programs that invest in key education priorities for Hispanics. The announcement was made today by Alejandra Ceja, executive director of the White House Initiative on Educational Excellence for Hispanics at the launch of Hispanic Heritage Month and in honor of the initiative’s 25th anniversary in Washington, D.C. The White House initiative named these 230 Bright Spots (catalog online at noon, CST today) to encourage collaboration in sharing data-driven approaches, promising practices, peer advice, and effective partnerships, ultimately resulting in increased support for the educational attainment of the Hispanic community, from cradle-to-career. 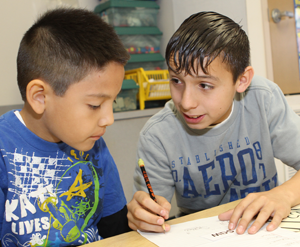 This cross-age tutoring program is research-based and has been recognized internationally for its high rates of success – keeping 98 percent of its tutors in school. See this highly-successful dropout prevention program in action and find out how you can strengthen your school’s holding power. At this one-day event, you will meet Valued Youth tutors, meet teachers who are using the Coca-Cola Valued Youth Program, learn who to get funding from federal and other sources, and see the program up close by visiting a school that is successfully implementing the program. Designed particularly for school and district administrators, teachers and community members. October 7, 2015 • 8:30 a.m. – 2:30 p.m.
La Quinta Inns and Suites San Antonio Riverwalk – Downtown in San Antonio. See the event brochure or visit IDRA's website to get details or register online now. Note: The hotel has extended the deadline for its reduced reservation rate to September 25. KLRN’s American Graduate Day is celebrating Dr. Cuca Robledo Montecel, IDRA President & CEO, and IDRA’s Coca-Cola Valued Youth Program. KLRN (PBS San Antonio) produced new video spot about the IDRA Coca-Cola Valued Youth Program is airing now and is online [01:30 min]. 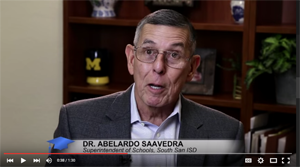 In the video, Dr. Abelardo Saavedra, superintendent of South San Antonio ISD, speaks about the districts long-time relationship with the program and how it has helped students in his district. He is joined by Coca-Cola Valued Youth Program tutor, Silvia Favela, a high school student at South San Antonio HS. KLRN and other PBS stations are developing these spots that are airing in September and on October 3 for American Graduate Day.